Every spring, my emergency calls escalate. One common complaint: Kitty plays too rough with the neighbors. It’s cat abscess season! Every spring, my emergency calls escalate. Among cats, the most common complaint has to do with kitty playing too rough with the neighbors. It’s cat abscess season! A cat abscess is the name for an infection that festers under the skin and breaks open. Most of these abscesses are from cat fights. Although I see abscesses all year long, they are more prevalent when more cats are going outside. In the spring, I think these cats are playing “Wild Kingdom.” Winter is for hibernating by the fire. Spring is time for sniffing out the new fur on the block. And some of that fur don’t want to be sniffed, if you get my meaning. Cats are very territorial. 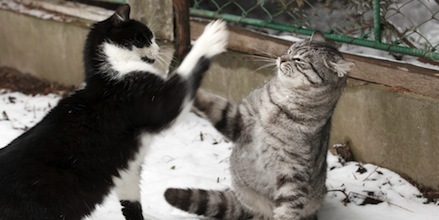 In the nice weather, if more cats are populating a set area, there are bound to be fights. Of course, there is always the unwanted foreigner who strays into your neighborhood (thus, the name!) and fights with the homeboys. 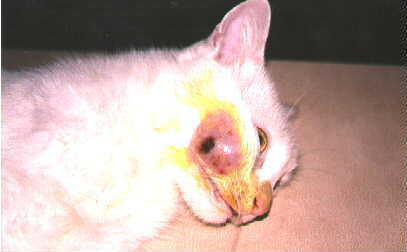 What Does a Cat Abscess Look Like? The most common presentation is an area on your cat that looks like an open sore with fur missing or matted fur. The area may be oozing yucky, smelly stuff. It may be painful or not. Before the area “abscessed,” your cat suffered a bite wound. Bacteria from the bite wound festered underneath the skin until finally it burst open, draining pus or blood, or both. You may not be able to see a wound until you look (or sniff) closer. Before the obvious wound is visible, you may feel a fluctuant swelling on your cat’s body. It is not always possible to find the wound or tooth mark. This is the abscess before it bursts. At this time, your cat may be acting lethargic, painful and running a fever. Often, we suspect a bite wound when your cat is running a temp, even if we can’t find the wound. This is called an FUO, fever of unknown origin. There may be no actual abscess to be found. Carefully clip away some of the matted hair if possible, so you can see what you’re dealing with. Apply a warm compress to the area if Mr. Fight Club allows this. Don’t get bit! A warm compress is a washcloth or small clean cloth soaked in very warm water. Hold it on the wound for a minute or two if possible. This may loosen the matted fur and can feel good if your cat is tolerant. Now you should be able to see what you’re dealing with. Cleaning the wound is always a good idea to prevent infection from spreading further. If your kitty seems comfortable and is eating, you can usually wait until morning (if this is after-hours) to see your vet. I don’t advise over-the-counter antibiotic ointments. Cats lick topical medications, rendering most of them useless. These abscesses almost always require systemic antibiotics. Even if the wound doesn’t look bad to you, you need to get a professional opinion. Your veterinarian will probably prescribe amoxicillin or clavamox after treating the abscess. Update: A reader wrote in, asking: “Why would people use peroxide on an abscess? Says right on the bottle, ‘For topical use only.’ Abscesses run deeper.” This reader has a good point. 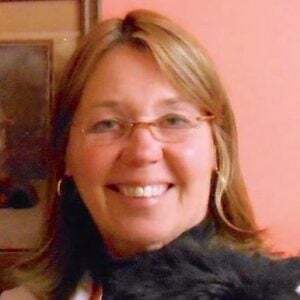 A famous veterinary surgeon who taught at Penn for many years, and taught me, agrees: Why would you use something that kills skin cells (hydrogen peroxide) when your purpose is to promote healing? That being agreed upon, many cat abscesses are quite superficial once they burst or open up. At home, I believe a one-time cleaning with hydrogen peroxide can do more good than harm. You are getting rid of the nasty stuff with a readily available product and doing it quickly. Many cats are not easy customers at home for copious flushing of wounds with sterile saline or Betadine solutions. Hydrogen peroxide should not be used in deep infections or fistulas or on a repeated basis. Unfortunately, many abscesses are serious and require anesthesia and surgical treatment. Once your cat is triaged, hydration status assessed, etc., your veterinarian will probably go ahead and give pain meds, anesthetize your kitty and address the abscess. The goal is to get the area as clean as possible, surgically debride the wound and treat it so it will heal as quickly as possible. After surgery, your cat may look like it just visited a cabin in the woods! A large area of fur might be shaved and a surgical drain in view. This is a plastic surgical drain placed at either end of the wound. It’s called a drain so that — you guessed it — the wound can drain! This is usually in place for two to three days. And what happens with a drain? It means your kitty usually needs to wear the “cone of shame” until the drain is removed. So Mr. Fight Club went in with an area of sloppy, sticky fur and a fever. He came out half naked, with a plastic drain on his side and an e-collar on his head! But, with treatment and antibiotics, the abscess won’t worsen and cause serious systemic illness. Your cat should be better quickly. And the fur will grow back. Make sure your cat is always up to date on rabies vaccination. Abscesses are usually “bite wounds of unknown origin.” In other words, Mr. Fight Club can’t tell you who he mixed it up with. Most states have very rigid protocols regarding rabies status and quarantines. If your cat is properly vaccinated, a rabies booster may be required in light of a mystery bite. If not vaccinated, he may be under quarantine. Besides introducing bacteria into a wound, a cat bite can transmit disease, including feline leukemia (Felv) and FIV (feline AIDS). Outdoor cats should be up to date on all vaccines at all times. Despite quick and appropriate veterinary treatment, some abscesses can require days of hospitalization or wound care, sometimes even multiple surgeries. If your cat was attacked by a wild animal or feral cat, or is in a debilitated state to begin with, the wounds can be life-threatening. The head and tail base are popular areas for cat abscesses, although these wounds can occur anywhere on the body. Bite wounds around joints can be particularly painful and difficult to treat, setting up the possibility of a bone infection (osteomyelitis) or septic joint. Wounds on the abdominal area can be tricky. Blood supply to the fat pads of the abdominal region is poor, so antibiotics may be needed in higher doses or for longer periods. Penetrating bite wounds in the chest are extremely dangerous. If a bite wound punctures the chest cavity, an infection in the thoracic cavity can be deadly. This condition is called a pyothorax. Cats who stay inside don’t run the risk of cat bites (except, perhaps, in a multi-cat household). But too many of you love to see your cat having a wonderful time outdoors. If you take the risk of letting your cat play outside, please get early treatment if you suspect a cat fight or an abscess. It can prevent serious complications that can develop from a simple bite. In the long run, Mr. Fight Club will do better and you will save time and money. And keep that rabies vaccination up to date. If you ask your veterinarian not to issue a quarantine when required by law, you are asking your vet to put his or her license in jeopardy. It’s like asking us to commit a crime. Seriously.